I love, love, love Indian food. Love it! (I'm nursing my daughter and she has an intolerance to a million things that I love to eat). Try goin' out for Indian food and avoiding all of those good things! This is such a great go to recipe when I have a hankerin' for a South East Asian meal. It's great for those of us with dietary restrictions! In a large pot, heat the oil over medium heat. Add in the onion and ginger and saute until the onion is translucent. Add in the cumin, tumeric, and garam masala and sautee for 1 minute, stirring frequently. Add in the lentils and stir for 1 more minute. Pour in the water and stir in the spinach and tomatoes. Turn the heat to high and cover and bring to a boil. 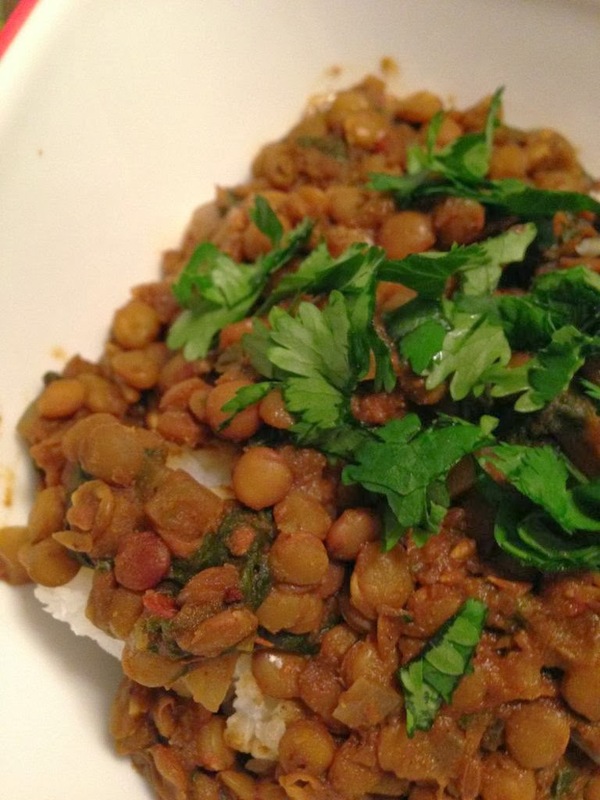 Reduce the heat to low and simmer until the lentils are very tender, about 1 hour. Serve over rice and top with freshly chopped cilantro. Put some chutney on the side and dig in. Delish! 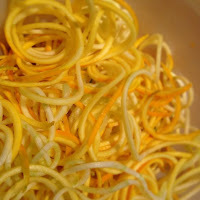 Vegan, Gluten Free Summer Squash "Pasta"
Gluten free pasta is gross!!! Eat this instead! 1 Large Container (2 lbs) Grape Tomatoes Sliced in Half or 12 Roma Tomatoes Chopped. I don't bother peeling or seeding them. Actually...I like the peels and seeds! 2 Large Cloves of Garlic, Finely Chopped. In a large pot, combine all but the squash and 1 tbsp. of olive oil. 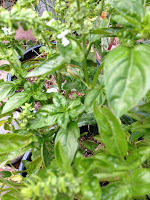 If you want the basil to look pretty and green, then wait to add it until the last 5 minutes of cooking. Cook over medium-high heat, uncovered, until the tomatoes begin to break down. Turn to medium-low and allow to simmer while the tomatoes continue to break down. The sauce is done once the tomatoes have fallen apart and the sauce has thickened slightly. Prepare the summer squash while the sauce is cooking. If you have space in your kitchen and $30 to spare, I would highly recommend the totally unnecessary, but totally fun, kitchen toy that I fondly refer to as the "spindarooli." 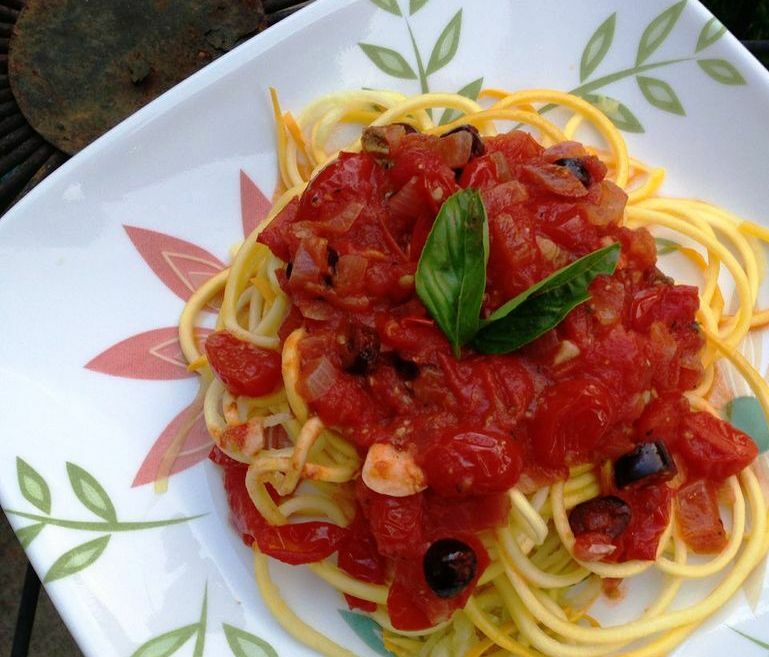 If you love pasta, but you don't eat gluten, it's a must!!! It shreds veggies into beautiful pasta width spirals (P.S. It has a wider blade too...curly fries, anyone?). If you don't have a spiral cutter, which I'm guessing most of you don't, you can slice the squash into thin rounds, ribbons or strands. When the sauce is nearly done, heat the remaining tbsp. of oil in a very large pan. Make sure the pan is good and hot. If it's too cool the squash will heat too slowly and get mushy. Toss the squash into the pan and stir frequently until just hot, again being careful not to cook it too much. Toss with the sauce and serve immediately. *Raw Directions: Roughly chop the tomatoes in a food processor in batches. Stir in the onion, garlic, basil, salt, pepper and 1 tbsp. of raw cold pressed olive oil. You can add Kalamata olives if you like, but I don't believe that I've ever seen an truly raw olives. Let the sauce to marinate for at least 1 hour. For best flavor, allow the sauce to sit overnight. Toss with the prepared, uncooked, summer squash. If you like the squash a little more tender, Let it marinate in the sauce 15 minutes before serving. I love, love, love, love cobbler. I even love it vegan and gluten free! Preheat the oven to 350. Toss the fruit with 1 Tbsp. of sugar and 1 Tbsp. of oat flour and pour mixture into a shallow baking dish. In a separate bowl, combine the rest of the flour and sugar with the salt. Stir in the oil and vanilla until the topping has a sandy, crumbly texture. Spread the topping evenly over the fruit mixture, then pop the cobbler in the oven. Remove the cobbler from the oven once the topping is golden brown and the fruit mixture is bubbly. Serve warm...with ice cream!!! Okay, vegan ice cream. * I didn't use any sugar, but they probably would have been a little more tasty (but a little less healthy) with about 1/4 c. of sugar. Hardest directions ever: blend everything together in a blender (I did mine in batches in my beautiful magic bullet) until smooth and pour into popsicle molds. You could also use Dixie cups covered with plastic wrap or tin foil to hold a popsicle stick in place. Freeze and enjoy! This little guy is fast and easy to make! I can turn one out in about 1 1/2 hours. What a sweet little toy to give away (or to keep for snuggling!). 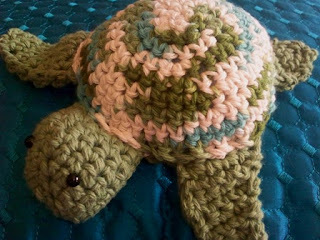 I like to use cotton yarn for this pattern, especially because there is so much more variety for the mixed color yarn. For the color combos I used, try a combo of Lily Brand Mod Ombre & Mod Green or Emerald Isle & Sage. Rnd 1: Crochet 6 sc using the Magic Loop method. Place marker to indicate beginning of round and move it up as each round is completed. Rnds 1-8: Work rnds 1-8 of top shell, fastening off after the eighth round. Affix the eyes to the head and stuff it. Sew 2 flippers together, repeat with remaining 2 flippers. Sew 2 feet together, repeat with remaining 2 feet. The head, feet and flippers will been sewn on between the top and bottom shell. Be sure to go through both the top and bottom layers of the head, flippers and feet and both the top and bottom shell. For example, when sewing on the head, the layers will go: Top shell, top layer of head, bottom layer of head, bottom shell. Sew on the head, and flippers (sew on the flippers so that they are angled away from the head), sewing the shell together between them as you go. Sew the shell together to the point where you will begin sewing on the back feet and then stop to stuff the shell. Sew on the feet and add more stuffing if needed before sewing up the shell. Be sure to sew tightly when sewing on the pieces and when sewing the shell together, or the fluff will come out of the sides. Work in ends and then give that cute baby turtle a squeeze!!! Sorry there's not a photo...we ate all of the cookies before I could take a picture. 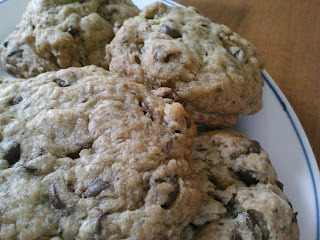 I based the recipe on the Vegan Chia Chocolate Chip Cookie recipe. It's an easy and tasty adaptation! I'm convinced that chia seeds are magical! Although you can't taste them in the recipe, they are an integral part, as their super amazing gel powers bind these yummy cookies together. Preheat the oven to 375. Grind up the chia seeds in a coffee grinder, or (my favorite option of course!) in a Magic Bullet. Mix the chia seeds with the water and let stand for at least 5 minutes. When the chia seeds are combined with water they create an amazing gel that works great as an egg substitute. With a mixer, beat together the virgin coconut oil, sugars, and baking soda until well combined. Add in the chia gel and vanilla and mix again until combined. Add in the chocolate chips, pinch of salt, and flour and mix together on low until combined. Pinch off about 2 tbsp. of dough and roll into a ball. The cookies don't really spread out, so flatten the ball until it is about 1/2 " thick and place it on an ungreased cookie sheet. Repeat until the cookie sheet is filled. Bake until golden brown around the edges, about 8-10 minutes. 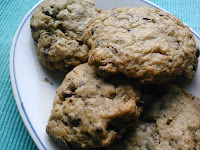 Try really hard not to burn your mouth when you bite into that right outta the oven, scorchin' hot, cookie. 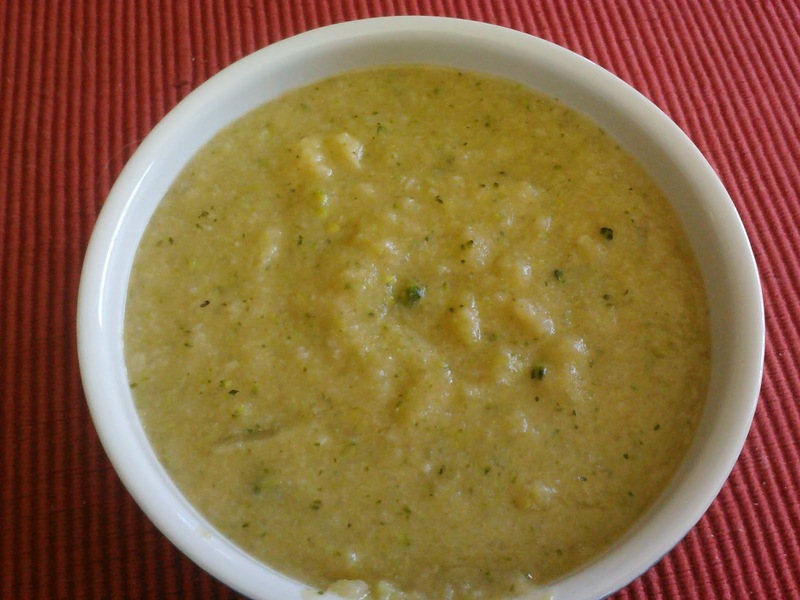 cheesy, dairy filled broccoli cheese soup. Heat the oil in a large sauce pan over medium heat and toss in the onions. Saute until the onions become soft and translucent. Add in all of the other ingredients, but the nutritional yeast, and bring to a boil. Reduce the heat and simmer until the rice, cauliflower and broccoli are very tender. 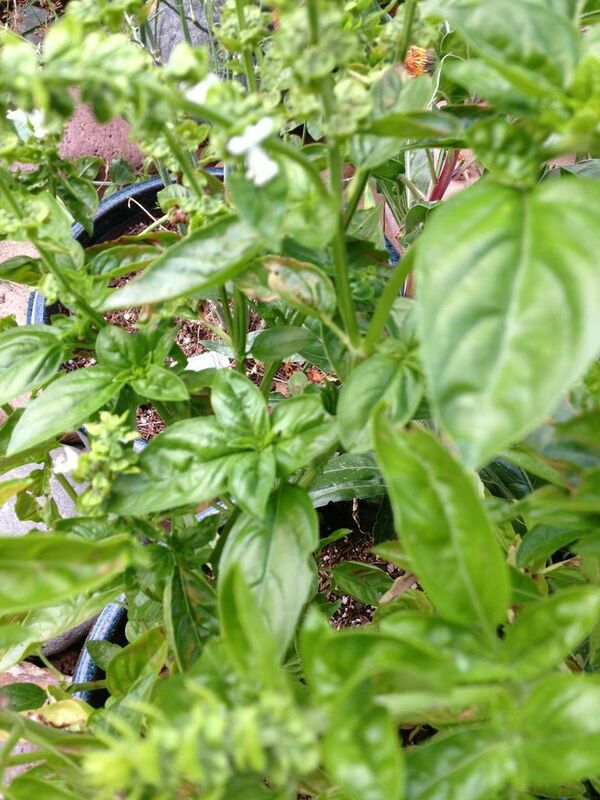 Remove the bay leaf and toss in the nutritional yeast. Puree with a stick blender until smooth and creamy. I like to leave the soup a little bit chunky, so I don't puree all the way. Add salt if needed. Yum! This salad is SO good! It's best when it has been marinating in the fridge overnight and all of the flavors have had a chance to combine. 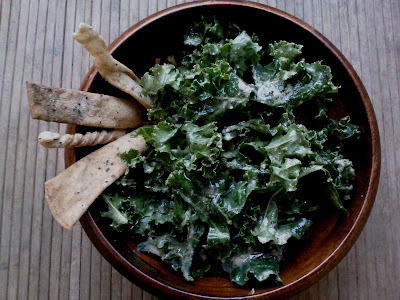 The flavor of the kale is excellent with the Caesar dressing. Dressing: Combine all ingredients in a food processor, blender, or a beautiful, wonderful Magic Bullet. Blend until the dressing is combined and the garlic is blended into the dressing. Toss the Kale in the dressing and refrigerate overnight. It may seem like more dressing is needed, but the Kale will release some liquid overnight as it marinates, so it should be perfect the next day. Yum! On the day that I made this vegan Caesar dressing, I also made some non-veg Caesar dressing. I have to say, I actually liked the vegan dressing better! Combine all ingredients in a food processor, blender, or a beautiful, wonderful Magic Bullet. Blend until the dressing is combined and the garlic is blended into the dressing.